Ray Chamberlin travels down a Berkeley path. The Berkeley Path Wanderers Association maintains paths in the Berkeley area. Attempting to travel the Berkeley hills on foot is a difficult feat. If lucky or knowledgeable, a wanderer starting at Grizzly Peak will find Whitaker Path. At first the wanderer has a view of the entire San Francisco Bay, but soon a wild, undeveloped Berkeley of long ago becomes apparent among the plants, boulders and original contours of the hill. A pile of lumber and freshly dug earth suggests, however, that the old path is being restored. It is the work of Charlie Bowen and the Berkeley Path Wanderers Association. 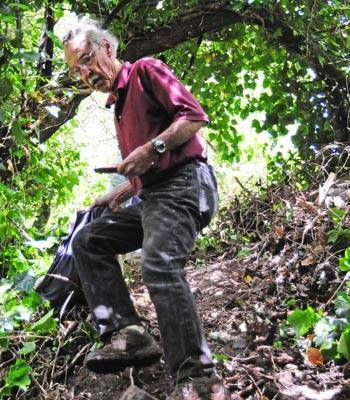 Bowen, who is in charge of building for the association, has spent almost 10 years working on a system of paths that provide access to the Berkeley hills. "Like an urban (adventure), you take a path walk in a part of town where you don't live," she said. Since 1998, the association has been mapping, restoring and improving signage on 136 paths that are owned by the city of Berkeley. Inspired by childhood memories and disturbed by a lack of awareness and upkeep of the paths she used as a child, Berkeley resident Jacque Ensign teamed up with three friends to found the association. "I started walking the paths that I had used as a child," she said. "Growing up I used a lot of them." Most paths are found in the Berkeley hills, with a few exceptions in the flatter parts of the city. The public pathways were first constructed about 100 years ago before most people had cars. Residents on the hills used the pathways to travel to Downtown Berkeley. Even today they are good shortcuts for pedestrians who do not want to traverse the narrow, winding roads. Renewed interest in the paths began after the 1991 Oakland Fire, when residents realized the paths could provide access to firefighters if roads are blocked, Ensign said. Now, people come from all over the East Bay to walk the paths for exercise and recreation, said Berkeley resident Steve Glaeser, who is a member of the association. "It's a beautiful oasis in the middle of the city," he said. Since 1998, the association has restored 23 paths that were overgrown with wild plant life or fenced over, Bowen said. Bowen said she recruits volunteers for restoration from local high schools, Boy Scout troops and UC Berkeley. Justina Chin, a UC Berkeley senior and the Greening Berkeley volunteer manager for Cal Corps, a public service group on campus, worked on one of the paths last semester. "It's one of the most gratifying things to do," she said. "You can see how much nicer it looks." Vincent Chen, an assistant civil engineer for the city, said that if the paths that will be restored are too steep, the city will step in and lay concrete steps and sometimes add hand rails. Usually restoration work increases awareness in the community rather then antagonizing neighbors, Glaeser said. "The more we improve the paths, the more people see the paths and get in contact with us," he said. Currently, there are 600 households that pay the annual $5 membership fee to the association, Bowen said. Each household receives a quarterly newsletter with information on organized walks and meetings, she said. Most members have little experience in engineering or construction; rather, the association is largely comprised of Berkeley residents who want to be outdoors and give back to the city. "Our organization is made of people who love to walk," Bowen said.